This experience dramatically changed the course of my life. Not only did I meet wonderful families impacted by neuromuscular diseases, but I connected with organizations providing services and resources for people with varying levels of abilities. Twenty years later, support group facilitator still is a title I proudly wear. What I’ve witnessed anecdotally in my own support groups is backed by evidence-based research: Social support experienced by support group participants improves coping skills, lowers depression and enhances quality of life. But not everybody has access to these benefits. 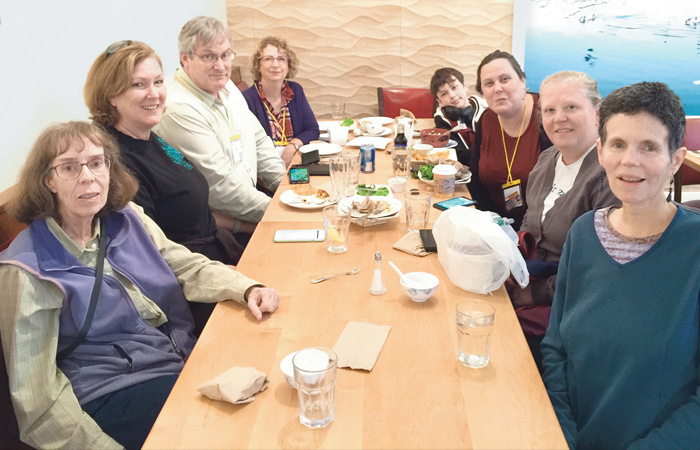 Tracey R. Young, of Beaumont, Texas, recalls how excited she was to meet and learn from peers at her first myasthenia gravis (MG) support group meeting. The problem was that the meeting was in Houston, 100 miles away. That prompted Young to launch an MG support group in her town. She started by contacting the Houston support group facilitator, who introduced Young to a larger network of Texans with MG and their families and friends. Through this network, Young identified a co-facilitator, who was a caregiver for her grandmother, and the two of them “got the word out to get people talking,” Young says. This included sending out Facebook messages and notifying other people in the area. Once they found a meeting place and set up monthly meeting times, they connected with two patient advocacy organizations, as well as the local neurologist, to help spread the word about the meetings. A support group facilitator’s main function is to plan and guide the meeting so that all participants leave feeling a little better than when they arrived. Although having tasty refreshments can go a long way toward satisfying attendees, the critical aspect to any meeting is good, clear communication. This includes your communication with the group, creating a safe environment to encourage participants to speak, and ensuring that any guest speakers provide helpful information. In my experience, the biggest challenge in facilitating a support group is handling open conversation. A facilitator’s goal is to draw out the quietest people. There is often a fine line between keeping the conversation energized and interesting while not allowing someone to dominate. My skills in this area have improved over the years. Strive to become a better listener and gauge the unspoken communication in the room. And sometimes you may need to exercise the refrain, “Let’s take this offline,” where appropriate. To establish a safe environment for everyone, draft ground rules to discuss with the group. Most important is for everyone to respect confidentiality and refrain from crosstalk when someone is speaking. Melissa Byrne, a clinical social worker in Richmond, Va., who facilitates an ALS support group, invites participants to contribute to the guidelines through a survey. The feedback “shapes group topics, provides insight into their experiences and encourages us to make changes when appropriate,” says Byrne. Receiving a difficult diagnosis for yourself or a loved one can make you feel alone. But you’re not. There is a community of individuals in a similar situation. And if you can’t find a support group for that community, chances are others need it just as much as you do. So don’t be afraid to become a support group facilitator. It will become a title that you proudly wear, too. Leslie Krongold, Ed.D., 55, lives in Alameda, Calif. After 20 years of support group facilitation and training peer and caregiver support group facilitators, she’s taken her passion to a podcast/blog at GlassHalfFull.online. • Start a private Facebook group and invite others to join. • Start a Meetup group that allows others in your area — or even around the world — to join. • Use a free audio conferencing service to schedule group conference calls. • Set up Skype video chats. Identify a meeting location. The best meeting place is a public location that is ADA accessible (including the restrooms). Explore hospitals, libraries and places of worship. Take parking and public transportation options into consideration. Determine your meeting frequency. Try not to overschedule in the beginning. Once your group starts to gel, you may opt to meet more frequently. Be sure to publicize your meeting at least one month ahead of time to give attendees time to plan. Choose a meeting format. Select a time and day that works well for you. No time will work for everyone, but your presence is critical. The average duration of a support group meeting is two hours. Some families will travel up to two hours to attend the meeting; make it worth their while. Make a plan. Create an agenda to structure the time. Allow for introductions, presentations or guest speakers, and discussion. Start and end the meeting on time; don’t penalize the punctual. Bring healthy refreshments, and consider sharing this responsibility with participants. MDA’s Resource Center is an informational hub for families living with neuromuscular disease. Contact the MDA Resource Center at 800-572-1717 or resourcecenter@mdausa.org. MDA’s trained resource specialists are available Monday through Friday, 8 a.m. to 5:30 p.m., Central time, to answer questions and provide one-on-one support and resources. They typically are able to answer questions within 24 hours of a request (or on the next business day). If you attend or lead a support group in your area, contact us today so we can include that information in our resource referral database.